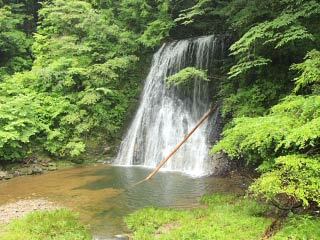 Yomogi Fudo Falls (四方木不動滝) is one of beautiful waterfalls of Boso Peninsula. It is located in Kamogawa, Chiba. It is 10m high and 8m wide. There are another waterfalls right next to this fall called Medaki. Need a car to visit. This place is very popular for Koyo. Many people visit here for Autumn leaves in Fall.